fresh dashi miso soup, originally uploaded by aarn! +4th March, 2009+. tuna), and maintained a temperature of the liquid just under boiling until the flakes were darker in color and not at the surface of the liquid anymore, then strained the liquid through cheese cloth, and discarded the used bonito mush. of this first dashi stock, 1/3c. was set aside for the ponzu sauce (see 'grill seared tuna steaks with a tangy fresh dashi ponzu sauce'). 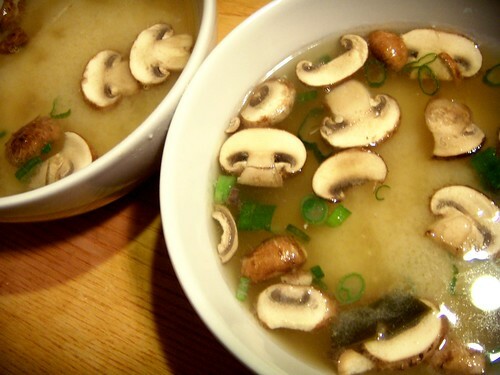 the dashi stock was returned to the sauce pan, and added to it were thinly sliced crimini mushrooms, sliced scallions, thin strips of dried kelp, and 8T. of sweet white miso paste (about 1T./c. of stock). this mixture simmered for a few minutes and was then poured over cubes of firm tofu in soup bowls.